As a new parent, everyone wants to offer you parenting advice. We’ve all heard the warnings that cuddling your baby too much can cause harm, making them more needy and clingy. But I have good news for parents who just love to snuggle their baby! Holding your baby has HUGE long-term positive impacts on their health and well-being. So, the next time your know-it-all neighbour gives you advice, tell them about these four science-backed reasons to cuddle your baby more. A recent study found that there are a variety of lasting benefits of skin-to-skin contact with your baby, including a higher IQ later in life. This study tracked premature infants over a 20-year period to see how increased skin-to-skin contact early in life affected their health and well-being as adults. Other amazing benefits of holding your baby close include improved neurodevelopment and lower rates of aggression as adults. Close contact with their parents can even reduce your baby’s sensitivity to pain and improve the chances of breastfeeding success, according to this study! As a new parent, you’re constantly a bundle of nerves. But studies have found that snuggling with a baby can actually calm a new mother down. In fact, all the mothers who participated in this study reported reduced stress levels after holding their baby for at least an hour. And since stress can have so many negative effects, from interfering with mother-baby bonding to decreasing the chances of breastfeeding success, holding your baby is that much more important! Your baby’s body is constantly growing and changing. And these changes can make it difficult for their bodies to regulate and stabilize on their own. But holding your baby close with skin-to-skin contact can help your baby regulate their body temperature, breathing, heart rate, and even sleep patterns. A long-term study also found that children who received a lot of physical contact as babies were able to better manage stress as grew into school-aged children. Another study found that mother-baby contact can actually change your baby’s cells on a molecular level. Babies who received less physical contact had molecules that were underdeveloped. While babies who were give more physical contact from their mothers had increased DNA methylation levels, which controls how active each gene within the child’s DNA sequence is, as well as how their cells function. 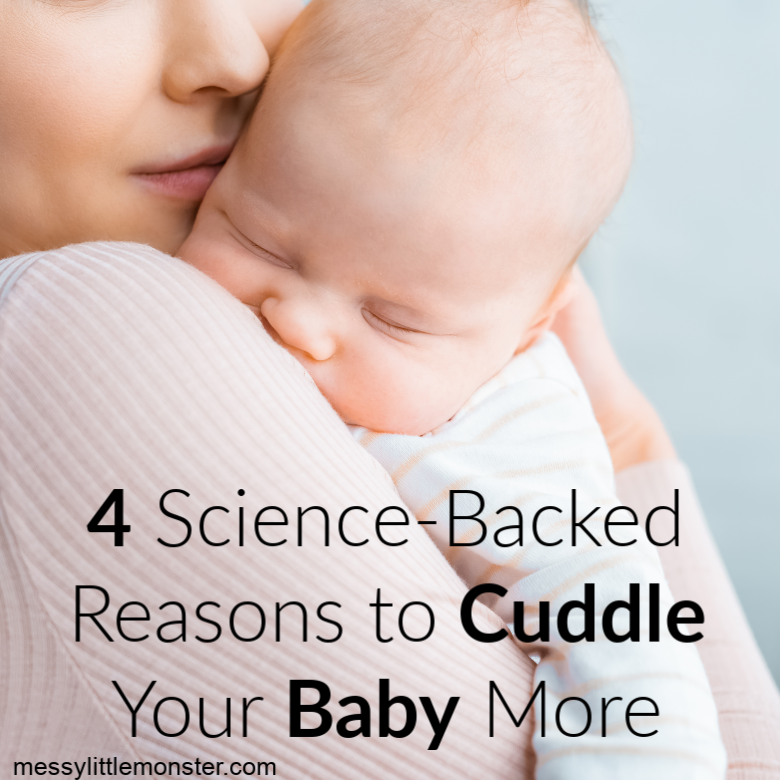 So if you needed an excuse to cuddle your baby more, these 4 science backed reasons provide all the evidence you need! On that note, I'm off to go snuggle my baby!